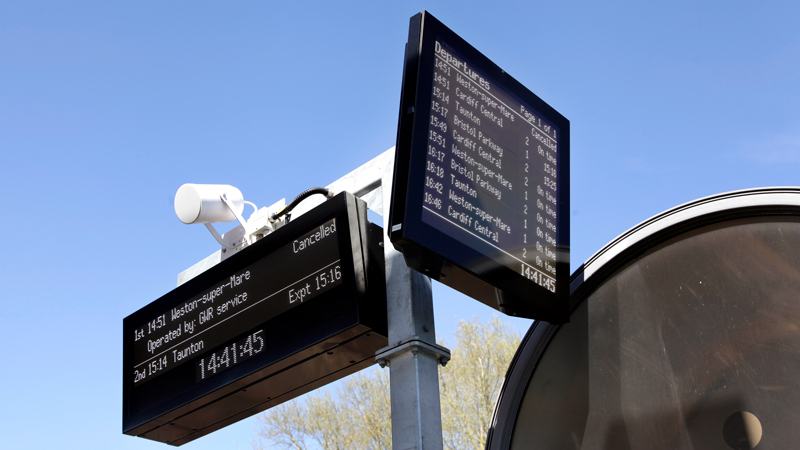 Increasingly popular white LED displays have been installed at a dozen Great Western Railway (GWR) stations in Central and South-Western England. Steelwork to support the passenger information displays was also included in the order, awarded to Infotec by Telent. Dorking, Exeter St David’s, Falmouth Town, Penryn, Torre and Worle are among GWR locations to have the full matrix displays installed. The Infotec range has been praised by the travelling public for its clarity and modern appearance. In addition to providing details of next trains, the on-platform FM42-W displays also show train formation information, indicating where buffet car, cycle loading, disabled access and first class facilities are to be found on each approaching train. Infotec has used its 3D CAD software to design support steelwork to carry the displays, which includes a bespoke post specially designed for mounting an FM42W-D platform display as well as an FM28 summary of departures display on the same structure. Standard wall-mounted and gallows post steelwork have also been provided. The CAD system allows engineers to generate three-dimensional images as pdf documents which provides clients with a life-like view of exactly what the finished product will look like. The vast majority of the new displays are now operational, helping regular commuters and tourists using the stations concerned stay fully informed.